8 www.coalage.com April 2018 news continued d a t e l i n e w a s h i n g t o n When you think of our industry today, imagine a spry, healthy senior — suddenly hit in a crosswalk by a drunk driver who runs a red light. The victim is now out of intensive care, regaining with the help of compassionate doctors his step and his confidence. But he is unlikely to play tennis or run a marathon ever again. Coal is, of course, the convalescing senior, the drunk driver is the past administration, the red light is the common-sense caution that was ignored not to weaken the coun- try's energy portfolio, and the kindly medical staff is the President Donald Trump administration. Analogies are imperfect, but this one is useful for seeing what hap- pened and pondering the next question: Now what? How can our senior regain as much strength as possible to lead a useful life and continue to support his family and friends? Coal has almost, but not quite, exhausted all of the treatments available to restore it to health. The list of regulations (read "costs") pulled off our back in the past year is long and impressive, including but not limited to the Office of Surface Mining's (OSM) stream rule and self-bonding guidance, the Environmental Protection Agency's (EPA) Clean Power Plan and the Bureau of Land Management's (BLM) coal lease moratorium. Now, the focus of treatment must move to the marketplace. Weak- ened by almost a decade of regulation, the surviving coal fleet faces daunting threats not only from cheap gas but from wind and solar that in 2016 alone scarfed up $7 billion worth of taxpayer subsidies. The Trump administration, independent regulators, grid operators, and utility and coal company executives have all weighed in with various ideas for re- taining baseload power by balancing the competition for power genera- tion. This chapter has yet to be written. Meanwhile, the EPA has held its last listening session to hear pub- lic suggestions for addressing the Clean Power Plan: repeal or replace it with some other carbon-cutting regime. The day-long event in Gillette, Wyoming, was a microcosm of the divided opinion over climate change, exposing a division as deep as a Wyoming coal seam. Environmental speakers predicted there, as they do in Washington, an "End of Days" Armageddon unless coal is left in the ground where we found it. Our side offered the EPA very different advice. "This vampire rule is in its undead state," said Cloud Peak Energy Vice President Richard Reavey. "If we don't kill it now and make sure it can't come back to life … it will be brought back to life by another administration." 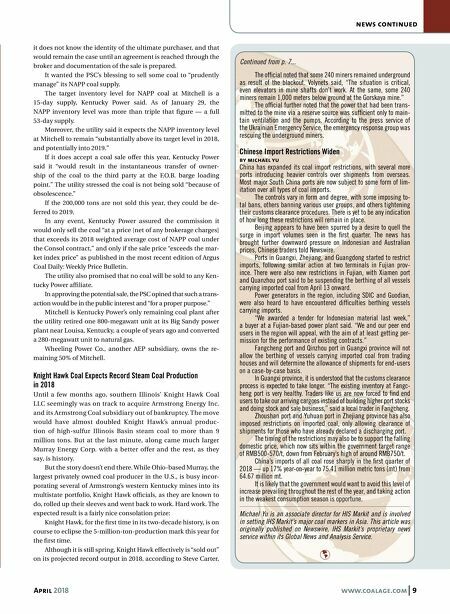 Wyoming econ- omists estimated the CPP would drop coal production 25% to 50% in a state that provides half of the coal used in the country's power generation. EPA Administrator Scott Pruitt recently assured dignitaries attend- ing a tour of Arch Coal's Black Thunder mine that the "war on coal" was over. It isn't, it's just no longer waged by our government, but by the well-financed green machine that has a foothold in Washington and a choke hold on the Democratic Party. There is one area of agreement that is often overlooked in this dis- cussion: both sides agree that any worthwhile solution to climate change will result from innovation. Nongovernmental organizations stress inno- vative programs to stimulate new jobs in renewable energy. In Gillette, for example, a local environmental attorney claimed the CPP "creates opportunity for mine reclamation jobs and diversifying the economy." Of course, the Wehrmacht created postwar construction jobs in Warsaw, too, but Poles would have preferred their capital as it was to the task of rebuilding it after it was blasted to rubble. Let's assume the 1,200 employees of the Black Thunder mine feel the same way about the CPP and their jobs. For their part, coal advocates who concede climate change isn't going away, also tout innovation. But they prefer innovative technologies over regulations for reducing carbon emissions. Wyoming's Gov. Matt Mead put it well at the hearing: "We did not move from the candle to the light-bulb because of regulation, or the carriage to the car because of regulation, but because of innovation." The question now is whose idea of innovation — ours or the greens — will prevail? The kind that stems from technology, or the kind that follows destruction? Luke Popovich is a spokesperson for the National Mining Association, the industry's trade group based in Washington, D.C. 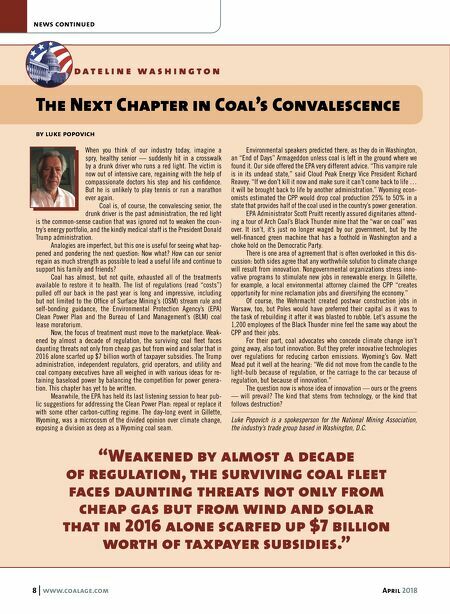 The Next Chapter in Coal's Convalescence by luke popovich "Weakened by almost a decade of regulation, the surviving coal f leet faces daunting threats not only from cheap gas but from wind and solar that in 2016 alone scarfed up $7 billion worth of taxpayer subsidies."